The Peacock shawl from Fiddlesticks is finished! What did I learn from knitting this piece? 1. The shawl was knit with Trenna, a new yarn from Schaefer. Like Zephyr, which seems to be the gold standard of lace yarns, Trenna is 50% wool and 50% silk. It couldn't be much different than Zephyr than if it were made out of Naugha hides. Trenna is more tightly spun than Zephyr and has the look and feel of silk. Zephyr looks and feels more like wool. I guess I still prefer Zephyr, because I just don't care much for knitting silk yarns in general. I gotta say that Trenna's colorways are gorgeous. I used Green Violet, and the colors are rich, saturated, subtle, etc. etc. Zephyr comes in a million colors, but all of them are solid. Not even a heather to relieve the eye. Red Bird Knits occasionally carries some Zephyr handpaints, but only a very few. The first person to make a concerted effort to offer handpainted Zephyr, or something similar, will make a good bit of money. Most of it mine. I started the shawl with my shiny new KnitPicks. Aside from the fact that they started turning black about halfway into the project, they were really too slippery for Trenna. Despite their loathsomely stiff cables, I went back to my Boyes for the rest of the shawl. I gotta wonder what Boye is thinking. Strike that. Not thinking. Why do they have such a miserable excuse for a cord on their circulars? I could use the darned things for croquet hoops. Or loopy garden stakes. But the tips are magnificent. Exquisite. Downright perfect. They are pleasantly color-coded and not too heavy in the smaller sizes. The interchangeable NeedleMaster set goes down to size 2, which means there's always a hole for a lifeline (unless you are knitting lace on smaller needles, in which case you are a lunatic and probably don't think about lifelines). The case is slim but still has room for a tape measure, markers, and the like. But the cables are just miserable excuses for flexible plastic. 3. I am truly tired of turquoise and am not too fond of T-pins right now. I truly agree with you on the Boye needles (though I have not tried the Knit Picks set yet). 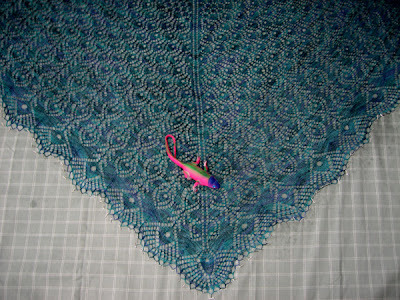 Absolutely beautiful shawl, and great to hear your opinion about the Trenna yarn. All those crochet loops on the border look quite daunting to me! I love the shawl. Such a pretty color. But I do know how you can get tired of a color of yarn after knitting with it for months. oooh, isn't Cheryl Scheffer is the yarn color Siren? Lovely shawl. You've done a wonderful job, it looks gorgeous! Sweet! Thanks for the info re Treena. But Zephyr still rocks my world. Barbara at http://www.furryarns.com/ offers handpainted Zephyr. No affiliation, just a happy customer. That is gorgeous! And the colour compliments the name of the shawl as well... it's a true Peacock. What next? Mountainash? That shawl is stunning. I'm glad to now about the Trenna yarn. Sounds like my love of Zephyr will remain intact. That is amazingly beautiful! See, your knitting doesn't hate you! I think the next one will be Heere Be Dragones. See this link. Tres fabulous shawl! Lace knitting is so inspirational. I love the process: from skein to finished bunch of yarn goo to blocked beauty :-) The colorway was perfect for your project! Congrats on a lovely work of knitted art. Gorgeous shawl, love your blog and sense of humor! Would love to see a close up or three of the shawl! I love my KP Options, but yes, they are slick. I'm wondering how long they will stay shiny. I can strip the plating off anything inside of 30 minutes, can't wear anything but real gold. Silver turns black instantly. The older metal needles turn my hands black and get pitted real quick.